We offer short-term lodging in the historical district of La Daurade in the city of Toulouse, France. Our apartment is a large studio located in the heart of the city. 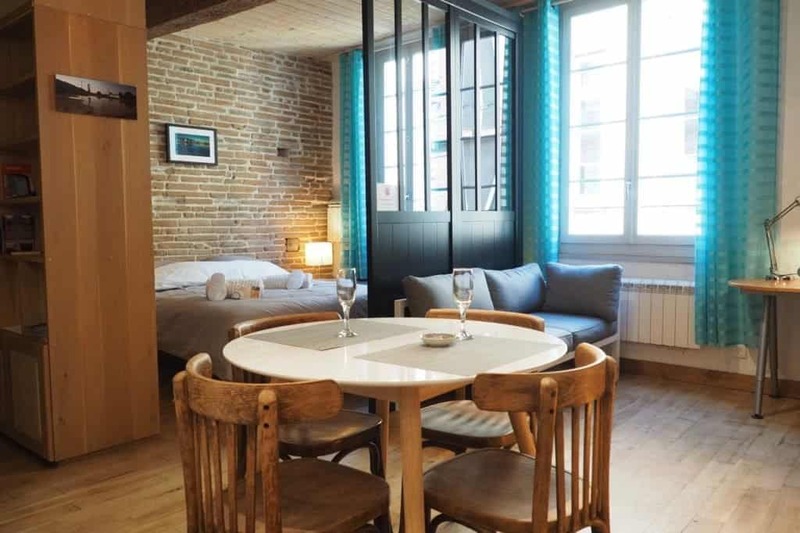 It is close to both metro lines, shops, restaurants, museums, the Garonne river… Its location is ideal for tourists who want to discover Toulouse by foot or public transportation. It is also completely suitable for business travelers. The apartment is in a typical Toulouse building built in the 18th century (bricks, exposed wooden beams). It has been completely refurbished and decorated by us. It is well equipped: kitchen (stove, dishwasher, fridge, freezer, large counter, microwave, Nespresso machine, kettle, toaster, dishes, utensils…), washing machine, clothes dryer, iron, fan, hair dryer, cable TV, WiFi, storage… You have also access to a DVD player and a DVD library. The main room consists of an open kitchen with bar, a lounge and dining area (table, sofa, desk) and a separate sleeping area with a quality double bed. For quiet nights, the windows facing the street have soundproof double glazing. Bed linen and towels are provided as well as toiletries and consumables (dish soap, coffee pods…).